Halo engagement ring settings have become rather popular in the last few years, but they were originally made popular in the 1920’s. Engagement rings and wedding fashion in general experience different trends and evolutions of what is popular. Today, more than ever men and women are embracing the old by choosing to wear vintage-inspired attire and wedding jewelry. Halo engagement ring settings take their inspiration from the decadent 1920’s and many women are gravitating towards these classic and elegant styles. 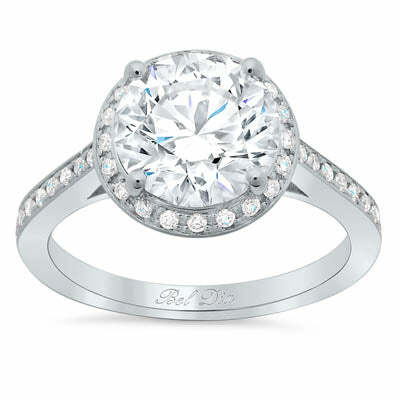 The halo setting features a halo of diamonds around the center diamond. The diamond halo perfectly complements and enhances the center diamond in a brilliant, but not overpowering manner. These rings can be as plain or as whimsy as you want, but the romantic overtones are undeniable. These rings are made for each specific center stone to ensure that there are no gaps between the diamond and the halo. What do you think about these halo setting styles? Do you love incorporating the modern with the old for your wedding jewelry? Feel free to share your comments as well as your photographs in the comments section of our post.